Plastic waste is a threat to rare species of Gobi Desert, not just marine animals. 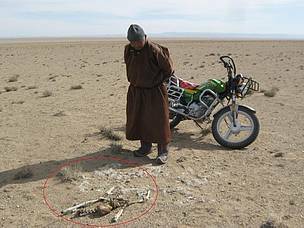 A ranger from Bayan-Uul soum, Gobi-Altai province of Mongolia found a saiga carcass in Khuisiin Gobi of Altai Sayan Ecoregion. According to him, the Mongolian saiga had eaten a plastic bag and the stomach still wasn’t decomposed. In recent years, rural people have been using plastic bags a lot and it’s common to see plastic waste in the Gobi desert. Unfortunately, it is clear that rare animals, such as Mongolian saigas are eating plastic waste due to scarce food. In the meantime, WWF-Mongolia initiated “Plastic free rivers” initiative to engage stakeholders in the process of reducing plastic waste from rivers. The start of this initiative has begun in July 2018 to remove plastic waste from the Kherlen River from the eastern part of the country. Within the scope of this work, the community organized large cleanings along the Kherlen River and actively promoting the public awareness of plastic wastes.